Roughly 12" tall (not including the ears), this vintage style distressed Bunny is made from aged mohair. Her dress is cotton with a lace collar. Her little bunny doll is aged cotton. She is stuffed with soft polyester stuffing and has glass bead eyes. She is 5-way jointed. 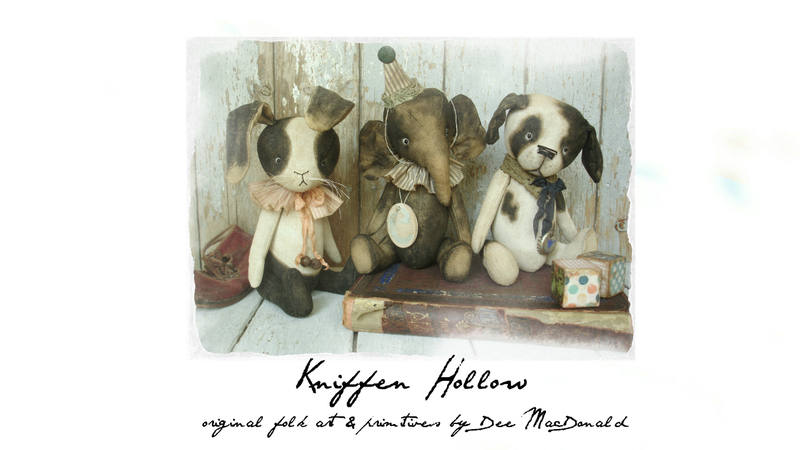 She is all hand-stitched from my own original design and pattern and has been aged to look and feel like an old toy. Her distressed look fits well in any antique or primitive display. This little bunny is intended for adult collectors and is not suitable as a toy for children. Roughly 12" tall (not including the ears), this vintage style distressed Bunny is made from an old wool blanket from my grandma's attic. Her neck ruffle is grungy aged cotton for an old antique look. Roughly 12" tall, this vintage style distressed Bear is made from an old wool blanket from my grandma's attic. His hat is grungy aged cotton for an old antique look. He is stuffed with soft polyester stuffing and has glass bead eyes. He is 5-way jointed. He is all hand-stitched from my own original design and pattern and has been aged to look and feel like an old toy. His distressed look fits well in any antique or primitive display. This little bear is intended for adult collectors and is not suitable as a toy for children. 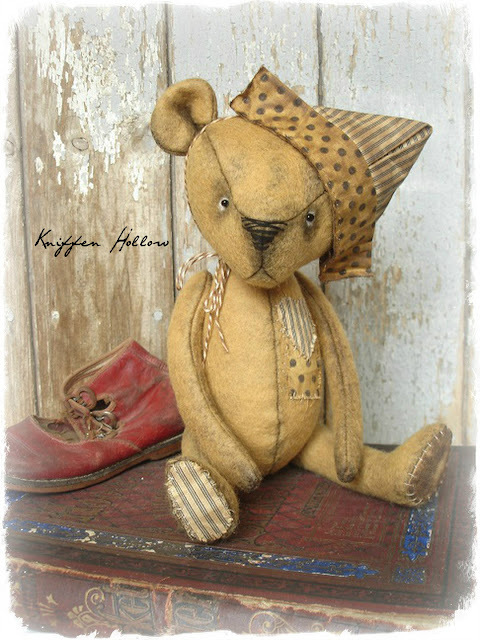 Roughly 12" tall, this vintage style distressed Bear is made of aged virgin wool felt. His hat is grungy aged cotton for an old antique look. Roughly 12" tall, this primitive style distressed Bear is made of painted and aged Osnaburg. Her coat and hat are wool with vintage crinkled ribbon. Roughly 12" tall, this primitive style distressed Bear is made of painted and aged Osnaburg. His trousers are wool flannel and he has rusty wire glasses. 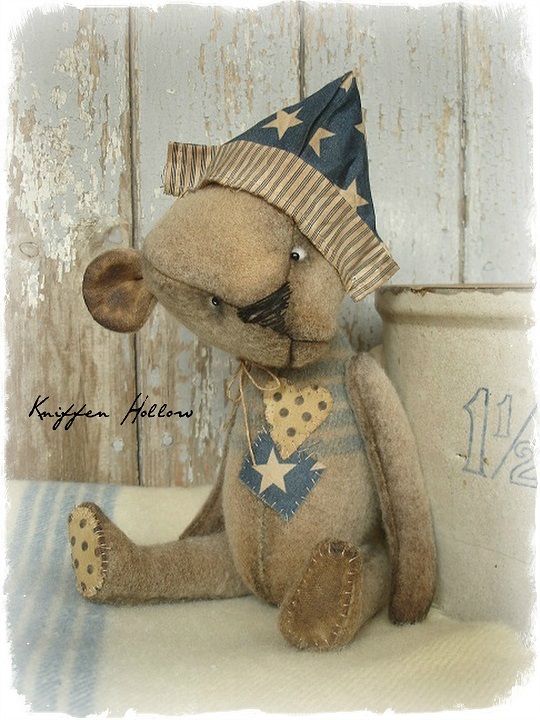 He is all hand-stitched from my own original design and pattern and has been aged to look and feel like an old toy. Her distressed look fits well in any antique or primitive display. Roughly 12" tall, this primitive style distressed Bear is made of painted and aged Osnaburg. His trousers are wool tweed with a cotton newsprint hat.